Experience this classic Northern Chinese cuisine in a whimsical, Chinoiserie-inspired room crafted in bright colors with bold details, including the oversized chopsticks that adorn the walls. In this fanciful a la carte restaurant, you'll enjoy the showmanship of preparation, starting when you choose your favorite noodles from nine varieties, including Beijing la mein, Shanxi knife-shaved noodles, and "Cat's Ear" noodles. Then select your preferred soup or garnish from an extensive menu that includes braised Australian abalone, stewed tomatoes and eggs, and much more. Rice dishes, dim sum, congee, as well as other hot and cold choices and Northern Chinese specialties, are also available to ensure a satisfying, delectable experience. A rich culinary tradition is celebrated at 99 Noodles, where our talented chefs combine authentic hand-pulled and hand-cut noodles with a variety of delicious, savory broths. 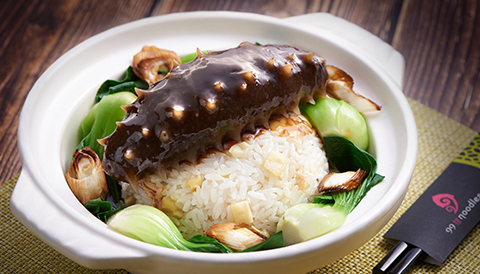 Treat yourself to a healthy menu of flavorful, immune-system boosting specialties showcasing the delicious, nutrient-rich tastes of bolete mushrooms, Japanese Kanto sea cucumbers, spinach and silkie chicken. Defeating cold and flu season has never been tastier!